Moscow court upholds sentence for Navalny brothers in Yves Rocher case | Russian Legal Information Agency (RAPSI). MOSCOW, February 17 (RAPSI) – The Moscow City Court on Tuesday upheld the sentence handed down to Russian opposition stalwart Alexei Navalny and his brother Oleg in the Yves Rocher embezzlement case, RAPSI reports from the courtroom. In late December 2014, the Zamoskvoretsky District Court in Moscow passed a suspended 3.5-year sentence on Alexei Navalny. His brother Oleg was sentenced to 3.5 years in prison. 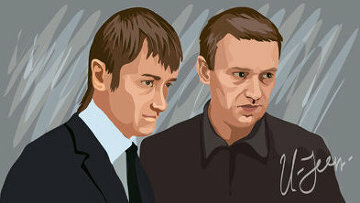 The Navalny brothers were convicted for embezzling 26 million rubles ($415,000) from cosmetics company Yves Rocher Vostok and 4 million rubles ($64,000) from the Multidisciplinary Processing Company by way of a fraud scheme. The brothers were also ordered to pay out 4.4 million rubles (about $70,200) to the Multidisciplinary Processing Company which claimed damage. The ruling therefore took effect. However, the court on Tuesday increased a probation period for Alexei Navalny from two to five years, it will expire in 2020. The house arrest of Alexei Navalny was overturned. The court also excluded a 500,000 ruble fine ($8,000) imposed on him from the judgment. Prosecutors during the appeal hearing demanded 10 years in prison and 2 years of restriction of freedom after release for Alexei Navalny. They also sought eight years in prison for Oleg Navalny. The defense team asked the court to acquit the brothers. Previously, he received a suspended five-year sentence in the Kirovles embezzlement case and has been charged in several other criminal cases. 17:26 17/02/2015 The Moscow City Court on Tuesday upheld the sentence handed down to Russian opposition stalwart Alexei Navalny and his brother Oleg in the Yves Rocher embezzlement case.